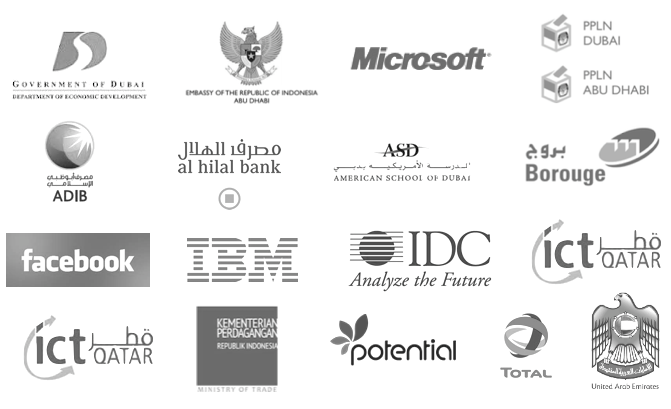 Headquartered in Dubai with development team across Middle East and Indonesia. Our solutions have been used in 10 countries by customers in various industries including public sector and government institutions. We strive for helping our clients gain competitive edge and be a winner through the ever-rapid evolution of Information and Communication Technologies (ICT). Our strategy leverages our unique ability to derive comprehensive value propositions that are focused on business-driven solutions, not just answering technical questions. To become a leading and dynamic business-driven IT solution provider of choice that continuously strives to create better experience and greater value to our clients. Helping businesses achieve competitive edge through effective and efficient delivery of Information & Communication Technologies. Our dynamic organization enables us to respond quickly to the rapid evolution in business needs and problems through our business-driven and best-in-breed solutions. We strive to build and maintain long-term relationships with our clients, communities, partners, employees and shareholders through our integrity, ethics, professionalism and mutual respect. Generating profit is key to sustain and grow our business and credibility. The key to mutual success is active listening to your business needs. We talk business, not technical jargons. We thoroughly analyze our client’s business situations, pinpoint any gaps and map them into a solution blueprint. We go the miles to deliver the agreed solutions to our clients. On time!